Are you stuck for another word for “green” or “red”? How about “jade”, “alligator”, “pine”, “kiwi”, “sage”? Or “vermillion”, “claret”, “cardinal”, “fiesta”, “ox blood”, “Ferrari”? “Black” a bit overused? Try “asphalt”, “obsidian”, “raven”, “sable”, “jet”, “ebony”, “oil spill”, “onyx”, “cinder”. 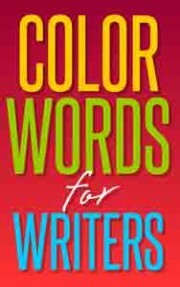 Described as a “surprisingly helpful tool for writers”, this ebook is a fast, specialized resource completely devoted to giving you hundreds of different words for colors. Every writer, fiction or non fiction, uses colors. And is always in need of a fresh, vital color word to create emotional nuance and punch up imaginative impact. No longer do you have to drag out your big thesaurus or search online. Simply click on the color you need and up pops a horde of vivid alternate color words right before you on your screen. Over 80 alternatives alone for “black”. Over 140 for “red”. Over 160 for “green”. And so on for other colors, including such wide ranging extra categories as “clear”, “mixed”, “jewel”, “neutral” and “metal”. Also included are notes on color meaning and significance along with common color phrases. Who needs Color Words for Writers? Bloggers who must turn out fresh, engaging posts daily. Copywriters seeking powerful images to persuade. Entrepreneurs creating outstanding promotional materials. Marketers describing hot new products. Content and article writers adding brilliance and zing to their work. Fundraisers and public speakers bringing life to heart-warming stories. Novelists, poets and fiction writers of every variety. Anyone needing a brainwave quickly for a color not limited to plain “pink”, “yellow” or “brown”. These color words were meticulously collected by an author who has been writing romance, YA and historical novels for over 30 years and who still uses them every day. This ebook is especially recommended as a jump start for beginning writers and is described by a user as “one of the treasures of my writing kit”. Your life is too busy to lose precious time racking your brain for that perfect word. Get Color Words for Writers and have it at your fingertips—instantly.